Welcome to our American Eagle coupons page here on Rather-Be-Shopping. They are one of the more popular stores on our site and personally one of my favorite clothing brands. They sell extremely comfortable and fashionable shirts, pants, shorts, and polos. Our online American Eagle coupon codes and discounts often include free shipping plus up to 60% off your clearance order. Other than signing up for our American Eagle coupon alerts at the top of this page, the best way to find discounts for AEO is by following them on Facebook as they constantly update their wall with new fashion trends and exclusive coupons. It is also worth your time to follow American Eagle on Twitter as you'll be updated with the newest online and printable coupons. They typically offer coupons for weekend shopping with new offers released on Friday mornings. It is in your best interest to try and shop at AEO on weekends as you're almost guaranteed to find a coupon to use. Lastly, if you shop at AEO often, you should sign-up for the AE Rewards program which allows you to build reward points redeemable for up to 40% off future purchases. Also, be signing up for free you'll get 15% off the month of your birthday, buy 5 Aerie bras and get the 6th free, and members-only sales and events. Be sure to visit the iTunes app store and download the new AEO app and you will receive 20% off your first purchase when you use the smartphone application. The app itself is really useful as it allows you to access special content, scroll through items and create outfits, and check-in to stores and collect coupon discounts. When checking out on the American Eagle website, you will enter your coupon code on the 'Shopping Bag' page. First, click on "Have a Promo Code?" then enter your code in the 'Promo Code' box. 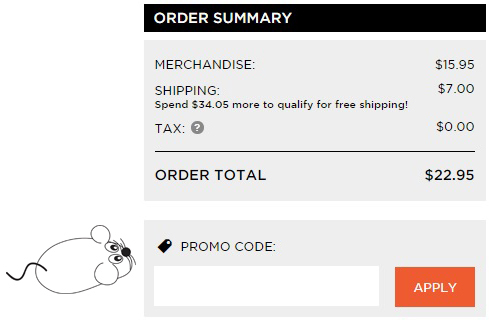 Then click on 'Apply' and make sure the discount is reflected in your order total before you wrap up your order. American Eagle has a pretty amazing online clearance section with savings up to 50% off the original price. They are known for having new styles on sale every couple weeks which means they are constantly updating their clearance department with new clothing. Go check it out for yourself. I like how you can shop by size which saves you the time it takes to look at every item to see if it is available in your size. American Eagle sends out coupons several times per month and we list them all on this page. Do NOT shop without one. They typically come out on Fridays and are good for your weekend shopping. The coupons are typically good for 20% off your order with free shipping. A few times a year, namely Black Friday/Cyber Monday and around back-to-school time you'll be able to find a 40% off coupon. Don't miss one of these great coupons by signing up for our free coupon alerts, just select American Eagle and we'll send you a coupon when one is added to Rather-Be-Shopping.com. The free AEO app has some cool features like allowing you to scan items in-store to get more info, news on the latest trends, and a cool 'style mixer' that helps you mix and match apparel to find your "look". But the best part is the exclusive deals and coupons sent right to your phone. Also be sure to download the free Rather-Be-Shopping.com app to get new in-store American Eagle coupons directly on your iPhone. You just present the coupon directly on your iPhone at checkout and the cashier scans your phone and you collect the savings. I am not embarrassed to admit that I have bought used American Eagle clothing from eBay.com. I actually think their clothing is softer and more comfortable when it has been worn and washed a couple dozen times. So why not buy it used, save a bunch of money, and have some cool new threads to wear. Just do a search on eBay for the words "American Eagle" and your size and you'll find some great deals from folks trying to downsize their closets. I am a huge fan of buying items on sale or with a coupon for the following year or season. For example, right now American Eagle is starting to clearance summer clothing like dresses, polos shirts, shorts, and t-shirts to make room for the new Fall arrivals. Stock up when you can score the best deal and store them for next spring and summer. This is also a great way to buy items for kids and teenagers. Just buy stuff a size larger and be ready for next school year. Combine clearance items with a coupon for savings up to 70% off the original retail price. Not too shabby. About Hollister: Apparel with a genuine SoCal style and vibe for young guys and girls. About Aerie: Aerie is the lingerie, bra, apparel, and pajama line from American Eagle.